We’re great fans of our solar-powered electricity system. We can run our air conditioning all day without worrying about the next GESA electricity bill – although, of course, such a system does require a fairly hefty investment up-front, so it’s not (as some people suggest) really free power. During the summer the system trundles along without too much input from us – correction, The Boss. Sure, he still disappears down to the dependencia (the building where batteries, invertor, and back-up generator are stored) every Monday, just to make sure there are no red warning lights flashing anywhere. 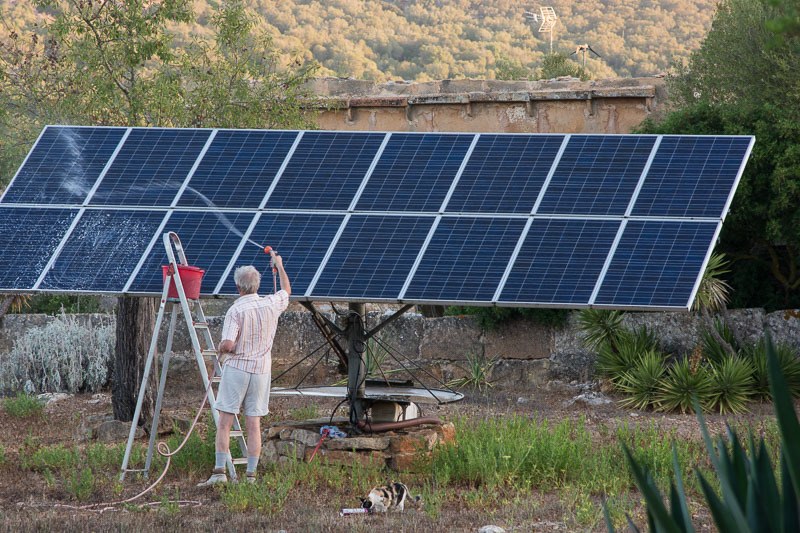 But during a long hot, extremely dry, and dusty summer, the solar panels do appreciate a little bit of TLC. Which is where The Boss, a ladder, a mop and bucket, and a hose come into play. This morning – just after 7am – he was up a ladder cleaning several months’ of dust and dirt off the panels, first mopping them with soapy water, then hosing off the suds. They’re gleaming clean now and probably soaking up lots more rays as a result. If anything’s going to bring on the long-overdue and much-needed rain, this morning’s clean-up should do it. Umbrellas at the ready, Mallorca? A summer wash for our solar panels. Note the presence of Pip – always ready to assist. Would be interesting to know the specifications of your system. Such as Watts, voltage, battery capacity, fixed or movable and also panel and overall cost? I’ve been thinking about installing solar panels for years. Always thought my roof doesn’t get enough sun, but with the more recent variety, apparently they collect energy even on the cloudiest days. And like you say, there’s that big investment up front. I have also heard that the new panels work well without full sun. They are a big investment though and although we had no choice but to ‘go solar’, we haven’t regretted it. Thanks for reading my post, Chris! It’s always interesting to hear about hands-on experience with solar. How much space does your energy storage unit require? I think those are getting smaller too.